Andrea Caldarelli and Ryo Hirakawa claimed victory in Sunday’s AUTOBACS Super GT season-opener at the Okayama International Circuit in Japan, a race hampered by rain and changing track conditions. Caldarelli, driving the no. 37 KeePer TOM’s Lexus RC F, started from pole position and was able to pull away, as his rivals battled for second place on the wet track. Ronnie Quintarelli (No. 1 Motul Autech Nissan GT-R) and Yuji Tachikawa (No. 38 ZENT CERUMO Lexus RC F) battled for second place, but once Quintarelli had passed the RC F he went after his compatriot. Quintarelli caught Caldarelli and after a nose-to-tail battle the Nissan moved into the lead on lap 17, only to be forced to return to the pits with a brake problem and handing back the lead to Caldarelli a couple of laps later. On a drying track the Drago Modulo NSX rapidly caught Caldarelli and onto lap 24 Takashi Kogure moved into the lead. Ten laps later teams started to make their regular stops, but rain made it difficult for the teams to make the right strategy call. After the pit stops a battle for the lead developed between the No. 100 Raybrid NSX, now driven by Takuya Izawa, and the No. 37 KeePer TOM’s car of Hirakawa. 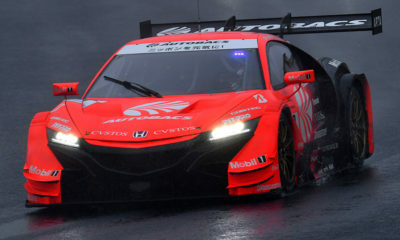 In the ever increasing rain Hirakawa closed the gap to the NSX and on lap 72 he overtook Izawa at Redman Corner. Hirakawa held onto the lead as other drivers slid off the circuit and after 82 laps the No. 37 crossed the line to win the first race of 2015. Hiroaki Ishiura nearly made it a Lexus 1-2, but the No. 38 ZENT CERUMO RC F missed out on second place by just six tenths of a second in the end. Izawa crossed the line in second place, 42 seconds behind the race winning Lexus. Koki Saga and Yuichi Nakayama won the GT300 class in the Toyota Prius, ahead of the ARTA Honda CZ-R of Takagi and Kobayashi and the Audi Team Hitotsuyama of Lyons and Fujii.